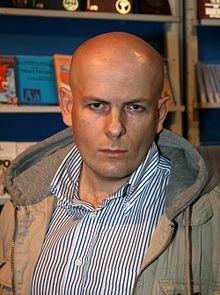 Oles Buzina (Ukrainian: Оле́сь Олексі́йович Бузина́; 13 July 1969 – 16 April 2015) was a Ukrainian journalist, writer, and politician for the pro-Russia Russian Bloc party. He was a journalist for the Russian language tabloid newspaper Segodnya. Buzina was born in Kiev. In 1992, he graduated from Taras Shevchenko National University of Kyiv. He was married and had a daughter. Buzina was shot and killed by masked men on 16 April 2015 in Kiev, aged 45. ↑ "Oles Buzina, pro-Russian journalist, shot dead in Ukraine". Australian Broadcasting Corporation. 17 April 2015. Retrieved 17 April 2015. This page was last changed on 17 April 2015, at 09:51.